Two misfits walk 2,000 kilometres along the Camino de Santiago to find themselves and, perhaps, each other along the way. Zoe, a sometime artist, is from California. Martin, an engineer, is from Yorkshire. Both have ended up in picturesque Cluny, in central France. Both are struggling to come to terms with their recent past—for Zoe, the death of her husband; for Martin, a messy divorce. Looking to make a new start, each sets out alone to walk two thousand kilometres from Cluny to Santiago, in northwestern Spain, in the footsteps of pilgrims who have walked the Camino—the Way—for centuries. The Camino changes you, it’s said. It’s a chance to find a new version of yourself. But can these two very different people find each other? In this smart, funny and romantic journey, Martin’s and Zoe’s stories are told in alternating chapters by husband-and-wife team Graeme Simsion and Anne Buist. 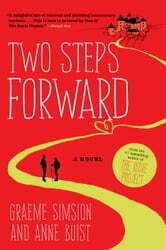 Two Steps Forward is a novel about renewal—physical, psychological and spiritual. It’s about the challenge of walking a long distance and of working out where you are going. And it’s about what you decide to keep, what you choose to leave behind and what you rediscover. Two Steps Forward was a thoroughly enjoyable read, as every Graeme Simsion book has been for me. The way he and his wife, Anne Buist, wrote it - with a chapter from the female's perspective, followed by a chapter from the male's perspective and alternating that way throughout the entire book - was so cleverly done. It really kept me entertained and provided lots of laughs! A terrific and memorable book, not to mention that I learned so much along the way! The book alternates chapters between the two main characters. It’s a sweet, easy read. Enjoyed the different perspectives of the 2 main characters. The unlikely journey of these 2 is believable and unbelievable at the same time. Really fun read. While it was very interesting learning about the Camino, I found the plot and characters unnecessarily complex. There were so many sub-plots and fellow travellers that I found myself getting confused as to who was who, and not really caring at times. The romantic tension between Zoe and Martin was sometimes annoying - just get together already! I loved Graeme Simsion's Rosy series. Having walked the Camino Frances myself, I enjoyed this book immensely. The authors captured the details of travelling light, daunting terrain, pensive solitude, and joyful camaraderie in such a way that I remembered my pilgrimage with fondness and gratitude. Whether you are curious about the walk or have done it yourself, this book and its characters will transport you there!